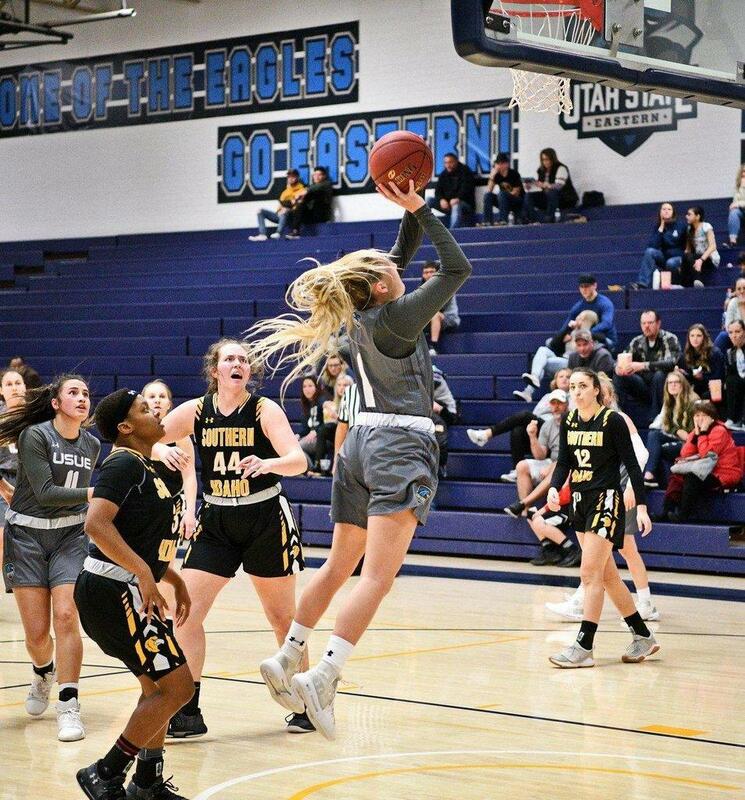 Utah State Eastern women’s basketball defeated the College of Southern Idaho Golden Eagles 75-65 on Thursday in Twin Falls. USU Eastern got off to a hot start against CSI, opening the game on a 12-4 run before the first media timeout. “We were sharing the ball really well and we hit the open shots. We were playing together as a team, which is exactly what we needed,” said USU Eastern forward Rylie Tobiasson. Following the timeout, CSI came roaring back and cut the lead to one with a minute remaining in the period. In the second quarter, the Eagles held on to their lead and extended it to as much as 16. “The second quarter really helped all of us with our confidence and gave us the energy to play harder,” said Tobiasson. USU Eastern got a spark off the bench in the second quarter from Tobiasson, who scored eight points, including two threes. “When I got called to go in, my first thought was to play for the team and assist them in any way I could,” said Tobiasson. The Eagles were plus nine in rebounding and 6-12 from three in the first half to create a 12-point lead at halftime. In the beginning of the second half, the Eagles struggled to get the ball to go in, going 1-7 from the field and 0-3 from the three. On the other side of the floor, CSI opened the half shooting 50% from the floor and forced three USU Eastern turnovers. In the third quarter alone, the Eagles were outscored 19-9 and shot 26% from the floor. Despite their struggles, the Eagles held on to a 50-48 lead at the end of the third quarter. The Eagles turned things around quickly in the fourth quarter as they began the period on a 11-4 run. “We hit some key shots, stayed focused and made plays down the stretch to keep the lead,” said Warburton. USU Eastern went on to outscore the Golden Eagles 25-17 led by Lamija Coric’s seven points. Coric led the Eagles in scoring on Thursday with a career-high 23 points. She also had four rebounds and two assists. “Lamija set the tone for us early. She played confident and it showed,” said Warburton. Freshman forward Morgan Toluono scored 15 points while grabbing seven rebounds and three assists against CSI. As a team, the Eagles out rebounded CSI 43-34 and scored 18 points on second chance opportunities. Thursday’s win was the first win over CSI in Twin Fall under Coach Warburton and was the second win over CSI this season. “It is a loud gym to play in, which makes for a great environment. Tonight’s win was a much needed win for our squad,” said Warburton.